While at Michaels a couple weeks ago a book on Kumihimo caught my eye. I looked through the book but didn't buy it. Instead I came home and did a bit of online research to check out the possibilities. Then I went back to Michaels to buy the book and since it included the necessary disk, about all I needed to add was some thread. The needlework department had a good supply and I was off and running (though not literally). Although this isn't the first braid I completed, it is the first completed project and was done in shades of blue cotton perle. I've done several braids and am ready to branch out and incorporate some beads into the braiding. That's what really caught my eye in the first place. But it's a little more advanced and I had to work my way up to it. Stay tuned--hopefully more braids are on their way. That is so beautiful, Diane. You are super fast. 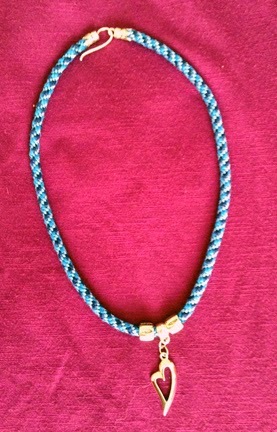 I bet you could open your own on-line store and sell your beautiful Kumihimo pieces.